The department Augmented Vision at DFKI deals in this project with a 3D Discrepancy Check for virtual product verification. Thereby a real object is captured in real-time with a RGB-D camera and compared to a reference model (e.g. CAD) of the object. Though algorithms for high precision reconstruction of objects with small or medium size using depth cameras are investigated and developed. Discrepancy check is a well-known task in industrial application. 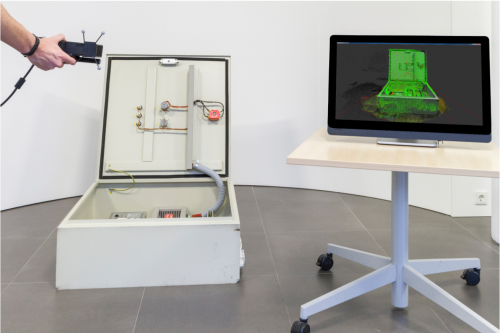 Within this project, the department Augmented Vision at DFKI presents a new approach for Augmented Reality 3D Discrepancy Check consisting of three main contributions. First, a new two-step depth mapping algorithm for RGB-D cameras is proposed, which fuses depth images into consistent 3D models with an accuracy of around 0.01m outperforming state-of-the-art algorithms. Second, a semi-automatic alignment algorithm is proposed, which rapidly aligns a reference model to the reconstruction and third, an algorithm for 3D discrepancy check based on pre-computed distances is proposed. The research on Discrepancy Check was performed within the ARVIDA project. This project is funded by the German Federal Ministry for Education and Research (BMBF) with actually 24 partners from research and industry. The main goal of the project ARVIDA is the creation of a service oriented reference architecture for virtual technologies (VT). The service orientation and the usage or rather adaption of available internet and VT-standards ensure interoperability between different modules and VT applications. A broad cross-company evaluation of the reference architecture in selected industrial scenarios guarantees that the results can be used as a future standard. As one exemplary application the 3D Discrepancy Check was developed.